Disclosure: This information and a prize pack was provided by Green Giant through MyBlogSpark. General Mills also made a $25 donation in the name of each blogger to the Pacer’s Center for Bully Prevention. These days our kids live in a world that is bigger and scarier than the world we grew up in. Children face so many challenges growing up in this very digital age. One of the biggest challenges is bullying, whether it be face-to-face or cyber bullying. 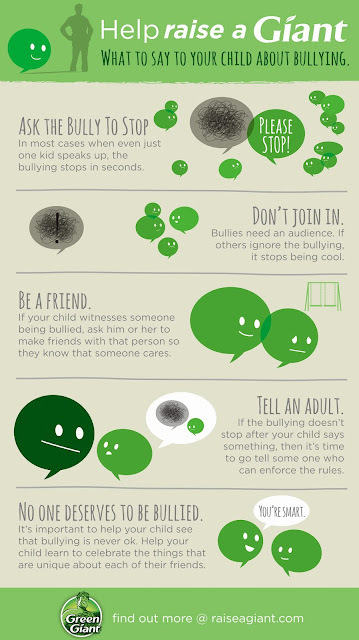 Our kids need encouragement and support in the face of dealing with peers who bully. When a child is bullied, it turns their life into a daily fight with fear and anxiety. No child should have to feel that way. 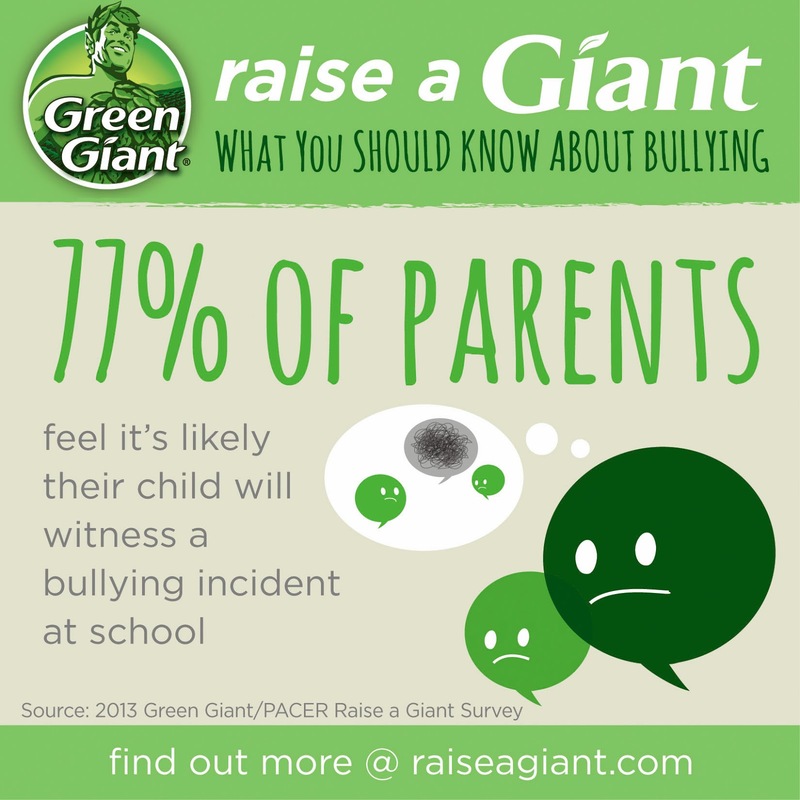 I thought that the Raise a Giant Campaign to Stand up to Bullying was very relevant and important to share with you. 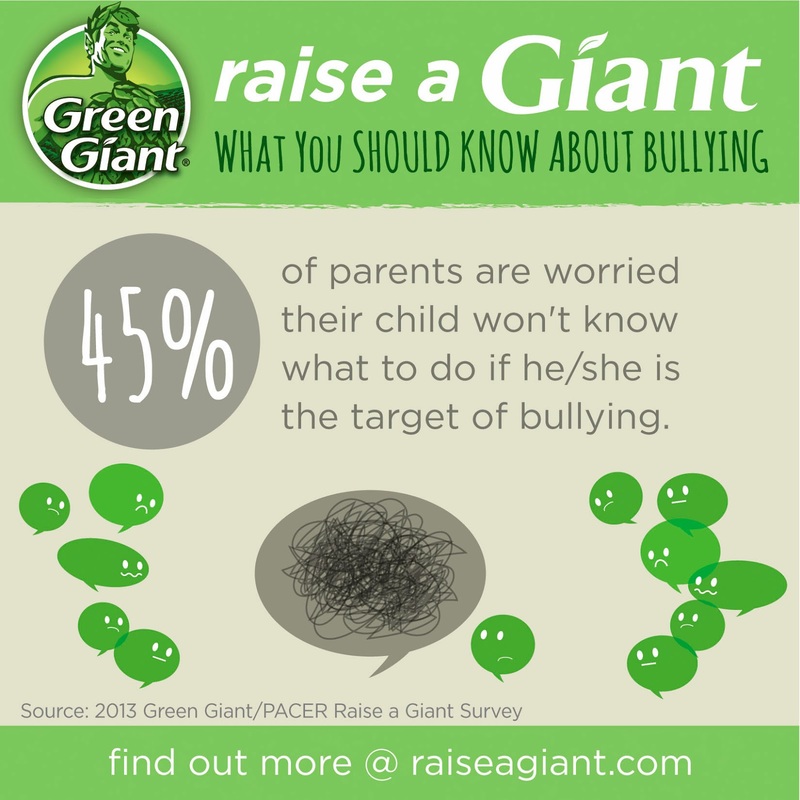 Green Giant is partnering with PACER’s National Bullying Prevention Center to develop an in-school student-to-student curriculum helping students understand how they can handle bullying. This partnership enables us to help those impacted directly by bullying – students. Green Giant is one of the proud title sponsors of We Day Minnesota – a stadium sized youth empowerment event that brings together inspiring speakers and performers to celebrate students who are making a di erence both locally and globally. This partnership is a reflection of Green Giant’s commitment to empowering youth to make positive change in their environment and the world. By sponsoring We Day, Green Giant is able to equip educators and youth with the tools and resources they need to become e ffective advocates of bullying prevention and peer-to-peer support. They want parents to spread the word and help kids to be Giants. Being a giant isn’t about being the biggest or the best. Being a giant means standing up for others, lending a hand to those who are in trouble, and speaking up for those who sometimes find it hard to speak up for themselves. It's a tall order to ask kids to have that kind of courage and they need our help! 1. 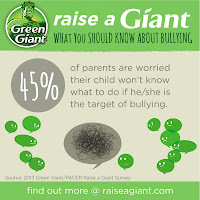 Write a letter to your kids about standing up to bullying and post it at RaiseAGiant.com. Then sit down and talk to your kids about your letter and how to stand up to bullying. 3. Share the Raise a Giant Video, Infographic, and Tips For Talking To Your Kids About Bullying on social media. Here is our letter to The Attic kids. Won't you join me in standing up to bullying and helping our kids become Giants? You are such precious joys! The days that you were born were the most important in our lives. God gave you such wonderful talents and loves you more than you'll ever know. So do we! Sometimes bullies are just mean. Sometimes they don't feel good about themselves and feel the need to make themselves feel better by putting others down. But it's never okay and isn't how God wants people to treat each other. Remember that golden rule: Do unto others as you would have them do unto you. It isn't always the easiest thing, but doing the right thing is important. I know we've raised you to remember these things and that you have very tender spirits. I hope that you will come to us to share whatever is on your heart. Know that we want the best for you and that we are here to help. Don't ever be afraid to tell us if someone isn't be kind or is hurting you. We're here to support you, protect you, and cheer you on always.